Last year, I semi-accidentally created my single favorite geometry activity of the year: class-collaborated Always/Sometimes/Nevers. You can read about my initial version of the activity here if you’d like. The post this year is in two parts. In the first one, I talk about what I love about Always/Sometimes/Nevers as a problem type and the type of thinking they let me see. In the second, I talk about the specific implementation technique I used to up the engagement and involvement. Feel free to skip a part if you don’t care! 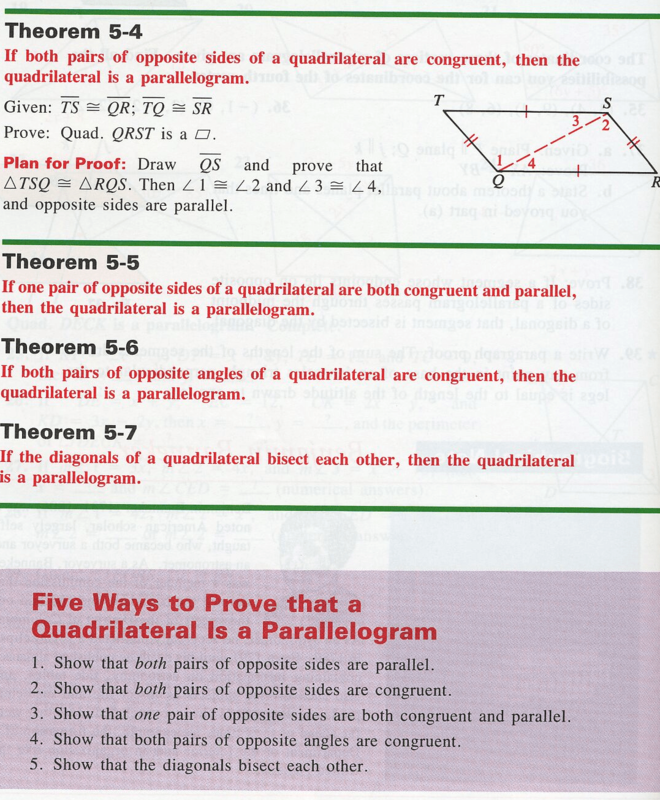 The ancient text we use has some good things going for it, but its exploration of quadrilaterals is heavy on “just the facts” pages with proofs required afterward and algebra/numbers-heavy problems like below (these are from different lessons so don’t be confused when they don’t see to match up). You can get some great discussion out of simple framework like this, and I have my students do a lot of proving during this time — both of the theorems themselves and other proofs. But I was starting to get that itchy feeling that my students weren’t internalizing these properties and theorems and that despite all the formality of a proof they weren’t really getting the relationships and hierarchies and connections. Bring on the Always Sometimes Nevers! If you’ve never been exposed to an Always / Sometimes / Never, here’re an couple of simple examples. Fill in the blanks below with the work “Always,” “Sometimes,” or “Never. ” Explain with pictures and/or words. A quadrilateral with exactly two right angle is _________________ a parallelogram. #1 is one of the ways we had discussed, proved, and used to prove that a quadrilateral was a parallelogram, so it’s essentially a “Fill In The Blank” memorized question. However, it’s not wildly easy to prove, so if they forget we already proved it then explaining why it has to be “Always” is kind of hard! #2, like many answers that become “Sometimes,” probes their creativity a bit – the best way to show a sometimes is to draw examples that both fit and don’t fit the scenario. I always tell students to start trying to do this if they are stuck on where to start, and in this case most students can end up drawing a rectangle and a long skinny rhombus or “classic” parallelogram to show this one. And #3, which is a “Never,” requires an explanation; either an argument about angles needing to add to 360 and opposites being congruent. OR a clever application of the fact that “if a parallelogram has one right angle it must be a rectangle” makes this impossible. So that’s one hopefully memorized fact, one pretty easy sketching/visualization application, and one tricky almost-proof, all hiding as the same problem type. And I can ask more! After a day of watching students interact with Always/Sometimes/Nevers I always feel like I have a better idea of the holes in their understanding not only of the content, but of the process of justification and logical reasoning. And I think they have generally moved closer to our ideal Van Hiele level 3 too. In fact, I feel like they probe those big ideas better than the Two Column Proof ™. If you’ve never used them – do! They’re awesome! My book includes a good number in its chapter reviews, and I know that Discovering Geometry uses them, but the best source of them I’ve found is CME Geometry, which tends to have them in big large chunks that are perfect for this sort of activity. I wanted to see everybody working on these and also have class discussion, so I used the same technique as my earlier post to create a collaborative discussion with both small group and large group components. Assign 4 or 5 “Always/Sometimes/Never” problems per group. Give the group time to debate it, then write up their answers and pictures/explanation. I used Google Slides because we are a 1-to-1 school, but small posters or whiteboards could work too. One problem per “page” is best. I gave about 15 minutes total for that part. Have the girls review the work of the next group over and add comments, suggestions, and questions. Again, I used google slides, so they left comments on the slides directly and in the “Comment” box, but post-its or comments in a different color on physical papers would work as well. Either gallery walking or just passing the papers over to the next group. They also tend to get a little excited adding images and jokes to the slides during this time, which I allow within reason (as you’ll see if you scroll down to the embedded document below). Continue the passing around until every A/S/N has been seen by at least three groups, and ideally by everybody. This entire process from start to finish took about 40 minutes for me. This year, I went through the slides one by one, read the comments and answer aloud. If all the comments were in agreement, I would do a simple “Does everybody agree that this answer is correct and explanation is complete?” final call for debate. If there was disagreement in the comments, I allow the students to hash it out, try to prove each other wrong, and work on the explanation. I try not to intervene directly here at all. Once the class agrees, by vote, that the slide is ready, I grade it right then, out of 5 points (generally either no credit, half credit, or full credit). Everybody gets the same grade. This year my grades in the two classes were a 90 and a 95 (which I entered as small classwork grades). If I were to do it again tomorrow, I’d have a student lead the final slide-by-slide discussion and I’d just do the grading and brief decompress at the end of each one, to help me avoid giving things away by body language and extra prompting when they have it wrong (or work to make sure to do extra prompting in the same way on every slide). But it was fascinating to see which holes they were able to work their way out of and which they weren’t. For example, if somebody had drawn a counterexample that didn’t really work, that generally got caught and improved in either the small groups or the large group. However, a few totally lauded “explanations” for Always or Never situations simply restated definitions with no additional info – for example one class wrote “if there are exactly two right angles then their can’t be two pairs of parallel sides” as their explanation for why a quadrilateral with exactly two right angles is never a parallelogram – but didn’t tell me why two right angles ensure that. And both classes really struggled with what should have been the two easiest ones – the “Always” properties we had already proved, like #1 above! That saddened me, but also confirmed that I was right about them not internalizing this stuff yet. Overall, solid A+ activity.